How can Roadrz help me? Roadrz oilfield dispatch software will revolutionize your business -- In today's crude oil market, you can't afford to not have Roadrz at your side. It's time to upgrade to the leading edge in crude oil trucking software to keep your company strong. Roadrz uses a centralized data store to save all data points collected in the oilfield and make them available via a number of dashboards to dispatch, well owners, and marketers alike. Roadrz collects as much data as possible concerning wells, drivers, shifts, deliveries, and more—and stores it in a secure central data store for easy access. Roadrz is a cloud-based application hosted with a world-class data center that guarantees uptime and access by any browser-enabled device. In an unpredicatable crude oil market, the road to profitability starts with a better view and increased control over your business. Roadrz will help you achieve your business goals. Every data point, every action, and every event is a mouse click away. Let us show you how Roadrz can take care of the heavy lifting so you can focus on your work. 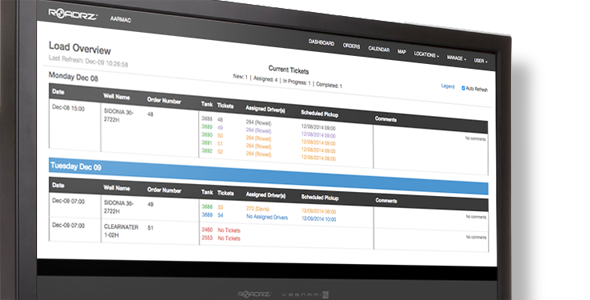 Click here for a free demo to see how Roadrz can lighten your workload and raise profits. © 2014 - 2015 Roadrz, Inc. All right reserved. Roadrz and it's logo are trademarks of Roadrz, Inc.